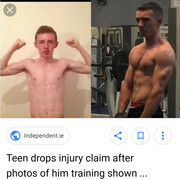 A talented young footballer has withdrawn a €60,000 personal injury claim after Instagram pictures of his body building and soccer training regime, following a road traffic accident, were produced in court. Barrister Shane English told 18-year-old Craig Melia that the pictures had been posted by him following the accident and at a time when he claimed he had to give up what “meant the world” to him, soccer and body improvement. Mr English, who appeared with Liz Lyons of Hayes McGrath solicitors, told Melia in the Circuit Civil Court that he had posted before-and-after pictures lauding how his body had developed from 2016 into 2017, the year he had the accident that had allegedly prevented him playing football and attending his gym. “You deliberately lied to every doctor you met in relation to this case by keeping from them that you had returned to playing football and training, including lifting weights, in the gym,” Mr English told Melia. Photographs presented to the court by Mr English showed Melia showing off his six pack in body shots relating to his gym work, posing with his father as they prepared for para gliding in Puerto Del Carman, Lanzarote, in August last year and pictures of him as captain of Swords Celtic soccer team. Mr English, who represented motorist Joseph Fitzgerald, Holywell Rise, Swords, and RSA Insurance, told Melia that his father, also allegedly injured in the same traffic accident, was taking a High Court claim against the defendants for personal injuries. He said a photograph showed him and his father “both paragliding” last year. Melia, of Swords Manor Court, Swords, Co Dublin, said he had been helping his father move furniture in a van on Saturday 1 January 2017 when their vehicle was struck by Mr Fitzgerald’s car. He said he had remembered practically nothing of what had happened in the accident that had interfered with and diminished his lifestyle. About seven hours after the accident he had developed pain in his neck and upper back and had gone to his doctor. He said he had to give up soccer which meant the world to him and going to the gym after the accident. Melia told Mr English, when he was shown the photographs, that he had continued training for football and playing and going to the gym after the accident. Doctors in his medical reports recalled having been told by Melia that he had been unable to get back to playing soccer and attending the gym. “You have told this court a pack of lies,” Mr English told Melia in cross-examination. Mr English told Circuit Court President Mr Justice Raymond Groarke that he was applying for the case to be dismissed on the basis Melia had misled doctors and the court in his evidence. Following a lunch-time break in the proceedings Judge Groarke was told that Melia was withdrawing his claim. Mr English said the defendants were not seeking an order for legal costs against him. Cultural heritage from yrs of post colonial dependency. I wonder where that hunger came from? He took a bogus claim, he got caught doing it, and still walked away Scot free ! Something wrong there somewhere ! I'd say having his face and this story come up on Google every time a potential employer/new boyfriend/girlfriend looks him up is a bigger punishment than ya think. Until recently these cases never got yer picture in the paper.The insurance companies must be ringing Independent newspapers every time they think they're gonna win a case to photograph and shame the scammers. Still'n'all I think it is Wrong. If you take a bogus insurance claim and get caught doing it then there should be some kind of Fine or Punishment ? It's what we in the gambling game refer to as a "Touch to Nothing" as in if you get a result meaning a "Touch" then you are 'Quids in' and if you lose, then you lose nothing at all. This fella got caught big time "At it" but still he walked away Scot free ?? He probably lives with his parents so locking him up for fraud seems a bit harsh when the prisons are full, taxpayer foots the bill in the end..By sticking up his photo others might reconsider making false claims.He could be a taxi driver in ten years.. Exactly, make him become a taxi driver as punishment. Its the only way he will learn. it might stop others trying it when he tells them about his life as a taxi driver. No. I guess he was unlucky enough. If the careless driver was insured by Liberty he woulda had a cheque in his hand quicker than he could say soft tissue injury.